Hansen vs Ishida and Uno vs Nishiura were two featherweight bouts added to DREAM's Fight for Japan card this May 29. 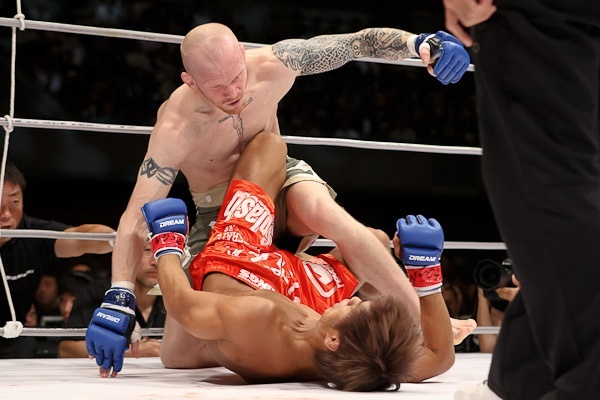 DREAM added two featherweight bouts for its upcoming Fight for Japan event. The May 29 tournament will also feature a battle between Joachim Hansen versus Mitsuhiro Ishida, and another brawl pitting Caol Uno contra Akiyo Nishiura. DREAM’s Fight for Japan producer, Keiichi Sasahara, also revealed that current DREAM featherweight champion – Hiroyuki Takaya – will likely return to defend his title this summer. As reported last week, Fight for Japan will grace the promotion’s quarterfinals and semifinals of its bantamweight grand prix. The event will take place at the Saitama Super Arena in Saitama, Japan on May 29.